I don’t think I slept in the same place twice the month of November. I’ve been travelling around Northern Vancouver Island with my friends and colleagues Emily Hoffpauir and Torrance Coste of the Wilderness Committee. Vancouver Island has been at the heart of the forest defense and Indigenous rights movements since the very beginning of the modern environmental movement. The loss of rainforests here remains one of the most challenging issues to find solutions for—except we are now at the dreaded breaking point that communities feared in the 70s and 80s. Logging corporations and government mismanagement have brought the rainforest to its final breaking point. Mills and logging communities are going belly-up, and ecosystems are in a state of emergency. Yet we are logging old-growth forests at a shocking rate, and governments continue to liquidate more ancient rainforest. We’re losing 34 soccer fields’ worth of old-growth on the island every single day and there is still no plan to support industry to transition from depletion of ancient rainforests to improved management of second-growth. Not only is this a travesty for local communities and watersheds, it’s also bad news for our climate. As Sierra Club BC’s Jens Wieting explains in this opinion piece, as a result of destructive logging and climate impacts BC’s forests are now releasing more planet warming carbon dioxide than all other provincial sectors combined, and these forest emissions are not even counted as part of provincial emissions. This month, Emily, Torrance and I visited Tsaxis (Fort Rupert), Gold River, Tahsis, Yalis (Alert Bay), Campbell River, W’as (Woss), and Port McNeill. We held our 11th “Let’s Talk Forest” town hall in Port McNeill. We shared thoughts and heard from community members in the tourism industry, municipal governments, First Nations, logging sector leaders, and BC government staff. We visited Schmidt Creek and confirmed logging has begun in BC Timber Sales (BCTS) cut blocks in the valley. The blocks, all located on steep slopes, were auctioned off this spring, sparking concern over the potential for landslides so close to important orca rubbing beaches at nearby Robson Bight. Schmidt Creek is located in Tlowitsis-Ma’amtagila territories, draining into Johnstone Strait between Sayward and Telegraph Cove on northeastern Vancouver Island. Click here for photos of Schmidt Creek. Logging by Lemare Lake Ltd in the area has had significant impacts in the watershed and there’s a risk of more serious landslides close to orca rubbing beaches. Lemare Lake has one of the worst environmental and safety reputations on the coast. Premier Horgan and Minister Donaldson have a duty to ensure the environment and the public interest are protected and we’re not seeing that in Schmidt Creek and neighbouring valleys with remaining old growth. Thousands of BC residents have called on them to protect remaining old-growth rainforests in areas like Schmidt Creek and the Nahmint Valley near Port Alberni. The BC government has ignored these calls to date. 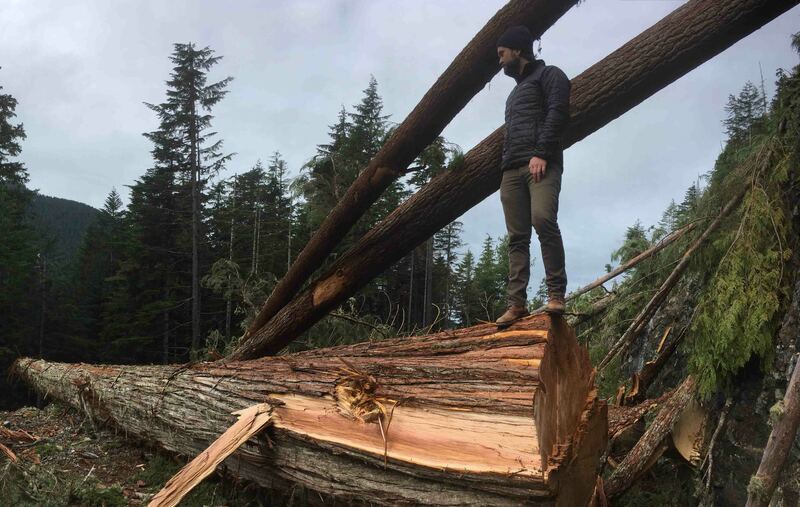 We also conducted field assessments of logging practices and ecosystem integrity in the Nimpkish watershed, the Tsitika Landscape, the Tahsish and surrounding drainages—sadly, all with extensive industrial logging damage to ancient old-growth forest ecosystems. The legacy of government mismanagement and corporate logging exploitation has never been more clear, and never more heartbreaking. But communities and First Nations are pushing back. They’re continuing to steward their forests by demanding companies like Western Forest Products not log in drinking watersheds like McKelvie Creek in Tahsis and immediately transition off old-growth logging. In every town and Indigenous community we visited, people are standing up to the BC government and logging corporations to take back some control over Indigenous and public forests. The Nuchatlaht Nation is in court to gain title back of their lands and the forests of Nootka Island. Kwakwaka’wakw Nations are standing up to logging companies and revitalizing their hereditary stewardship of their territories. And the Nuu-chah-nulth Tribal Council is speaking out against old-growth logging and in defense of their cultures and spirituality. In November, I helped organize a gathering of Indigenous community members from across Vancouver Island to talk forest stewardship with each other, and we will be converging again in the winter to keep the conversation going. 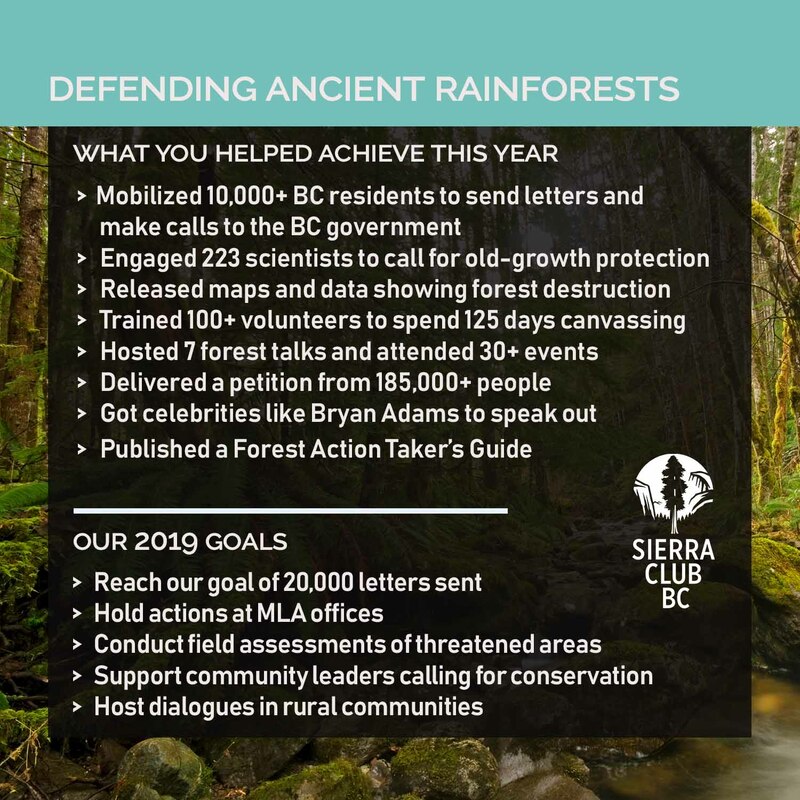 In addition, non-profit groups like Canopy, Ancient Forest Alliance, Wilderness Committee and Sierra Club BC are working together to push archaic BC government thinking into the 21st century. See what we’ve accomplished in the past twelve months with your help. We have a lot of hard work ahead of us, but we’ve done this before and we can do it again. The forests need us, and it’s an honour to work together for our shared climate solution known as Vancouver Island’s ancient rainforest. We’ve got a lot planned for our forest campaign in 2019. Please donate today to help us build on this year’s success. Feature image by Emily Hoffpauir: Old-growth logging on east slope of Schmidt Creek. 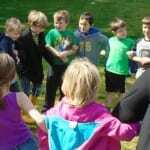 Looking back, looking ahead: 20 years of connecting kids with nature #VolunteerLove: Thank you for your impact!